SWEET HOME, Ore., Nov. 6, 2018 – The 54th U.S. Capitol Christmas Tree – an 80-foot Noble Fir from Oregon’s Willamette National Forest – has started its nearly 3,000-mile journey to Washington, D.C., following its Nov. 2 harvesting near Sweet Home, Oregon. The Oregon Forest Service nominated six trees as candidates for the special honor. The Noble Fir, the first ever to serve as the U.S. Capitol Christmas Tree, was ultimately selected by a representative of the Architect of the Capitol. “It’s a stunning tree and will certainly represent Oregon well when it makes its way to Washington, D.C. Oregon is the largest producer of Christmas trees in the country, but no other tree will surpass this one, which was found about an hour outside of Sweet Home,” said Nikki Swanson, district ranger, for the Sweet Home Ranger District of the Willamette National Forest. On hand and ready for the load was a brand new Kenworth W990, along with members from Central Oregon Truck Company, this year’s designated hauler of the U.S. Capitol Christmas Tree. 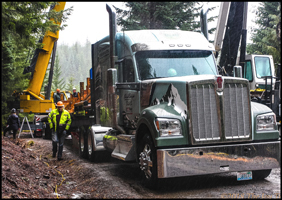 The company’s CEO Rick Williams; Phil Taylor, vice president of maintenance; and Brad Aimone, director of driver safety & services; watched as the tree was lifted by crane and set on the 80-foot long trailer. 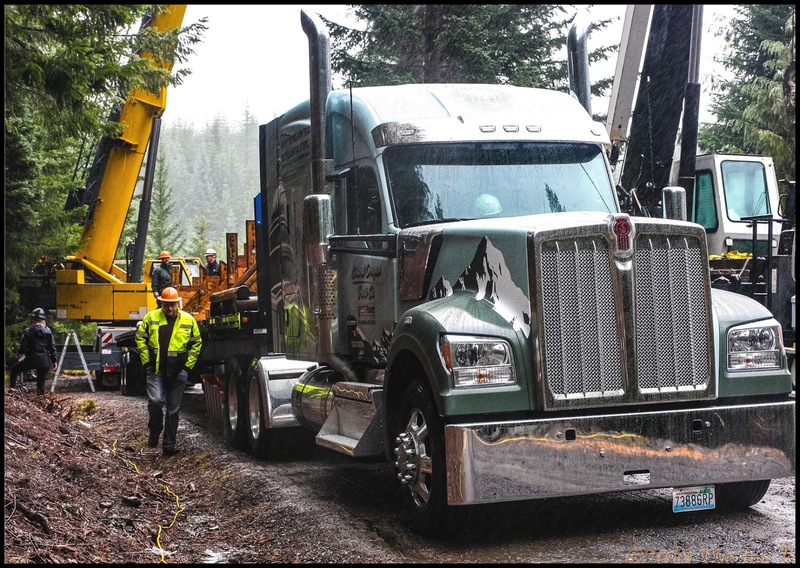 Williams, Taylor and Aimone are driving the Kenworth W990 and its special load as a part of an overall company effort that will involve other driving team members from the company. 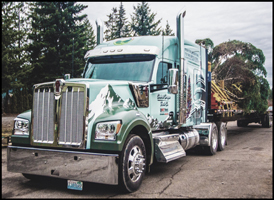 The flatbed carrier transports freight across the 48 continental states and Canada, and purchases its Kenworth trucks from The Papé Group, which is a major sponsor of this year’s tour. “It was a great sight. 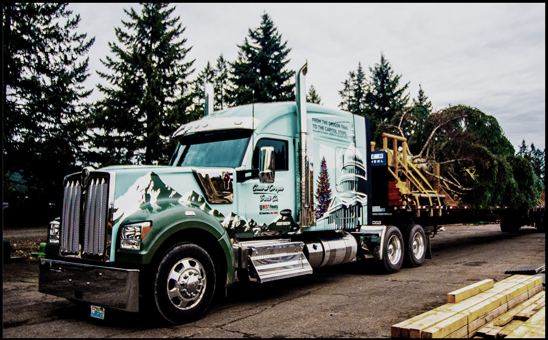 You don’t see an 80-foot tree loaded on a trailer every day, and they had to take great care to secure the branches,” said Rick Williams. Once in Sweet Home, the tree was fitted with a special 200-gallon water bladder – to keep it hydrated, carefully wrapped and boxed. Final preparations were then made for the cross-country transport. The tour, which follows the Oregon Trail in reverse, will officially commence when the tree departs Sweet Home and begins its journey 3,000 miles to the east. Along the way, the tree will stop for 25 community events, helping to celebrate the 175th anniversary of the Oregon Trail, and the 50th anniversary of the National Trails System Act. 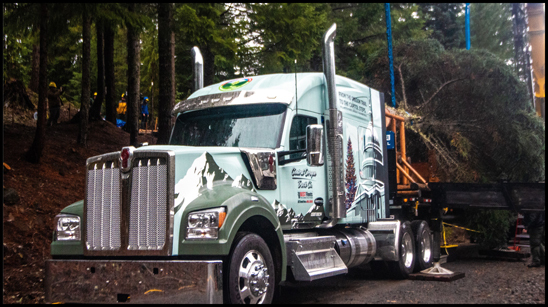 The Kenworth W990 transporting the tree features a distinctive graphics package with a brightly lit and colorfully adorned Christmas Tree next to the U.S. Capitol below the words “From the Oregon Trail to the Capitol Steps.” Featuring a 76-inch mid-roof sleeper, the W990 was spec’d with the PACCAR Powertrain – a PACCAR MX-13 engine rated at 455-hp and 1,650 lb-ft of torque, 12-speed automated transmission, and 40K tandem rear axle. The truck was also specified with the Limited Edition interior, premium GT703 seats and audio system, Kenworth Nav+HD, predictive cruise control, 1800W inverter, 180-degree swivel passenger seat, and Kenworth TruckTech+® remote diagnostics. The tour stops begin Monday, Nov. 9, at nearby Sweet Home High School where the tree will be the main event for a parade and street fair. The tour will end Nov. 25 at Joint Base Andrews in Maryland, before being delivered to the U.S. Capitol in late November. A special tree lighting ceremony on Dec. 5 will be hosted by the Architect of the Capitol, in conjunction with the U.S. Speaker of the House. For more information, including a complete tour schedule, visit the 2018 U.S. Capitol Christmas Tree website at www.CapitolChristmasTree.com. Choose Outdoors, a non-profit organization that works with the Forest Service on promoting outdoor recreation and public access to federal lands for recreation, assists with coordinating the annual tour.